The first ‘Magical Quest’ game was met with critical acclaim. Its easier sequel added an audience pleasing two player mode but failed to impress reviewers. Is there a reason why the lesser known third entry in this platforming series was a Japanese exclusive? You don’t get everything perfect on your first go. The best things are the result of refinement; enhancing what’s good and changing what’s bad. This is why yearly updates to established franchises aren’t entirely bad. 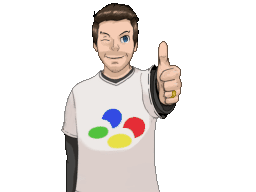 Developers can take their product, spend a year improving it and then offer it up to an existing customer base as an optimised and enhanced version. The player meanwhile gets a new iteration of a favourite title, which in theory will be better than it was before. There is an argument that opportunistic publishers are simply trying to convince gamers to re-buy a game they already have. In this modern age of online updates and DLC it’s certainly harder to rationalise. However, decades ago if you wanted your sports game to have updated team names, if you wanted your fighting game to have new fighters and if you wanted your platform game to have additional levels, you had to buy it again. There were two companies that were notorious for repeatedly attempting to sell full price re-workings of their most popular titles. Electronic Arts would pump out a new version of every one of their sports titles each year. The franchises under the EA sports umbrella were known for two things: minuscule changes between each of the game vrersions and the infamous “Its in the game” announcement heard every time you’d play. Similar Capcom had a penchant for frequently releasing updated versions of their most popular games. For example, there were four ‘Street Fighter 2’ games on the SNES in the space of eighteen months and it wasn’t just fighting games. The Mickey Mouse ‘Magical Quest’ platforming series was frequently criticised for simply recycling ideas, but it would be better to describe the sequels as refinements of a great initial game. The first ‘Magical Quest’ created the mound and set the standard that all later sequels would be judged against. It was hardly an original formula though. ‘Mickey’s Magical Quest’ features 6 worlds each consisting of several multidirectional scrolling stages. A Player predominantly moves from the left of the screen to a goal on the right, with obstacles to jump over and platforms to leap between. Level variety comes in the form of physics based puzzles; seesaws, collapsing bridges, swinging vines or obstructions that require a specific clothing to be worn. Three outfits can be found throughout the game, and wearing each gives Mickey a different set of skills. 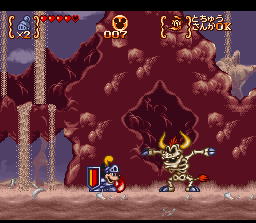 The climax of each world features an elaborate screen filling boss and defeating them rewards the player with a brief story interlude before moving onto the next stage. While critics unanimously praised the graphics and music, the general consensus was that ‘Magical Quest’ was too easy and too short. The sequel; ‘The Great Circus Mystery’ didn’t address this criticism, in fact it was even less challenging. This was largely due to the inclusion of a simultaneous two player mode, as Minnie joined Mickey on his adventure - the first time the female mouse had been playable in a video game. “Add a friend to the mix, and it delivers a whole new level of fun” GameSpy said when reviewing the GBA port. Sadly, the two mice played identically and Minnie was essentially just Mickey’s sprite with a bow. However, despite the sequel being easier it is certainly the better game. The suit mechanic in the first game was improved with a whole new wardrobe available to the player. The magician, rock climber and firemen suits of the first ‘Magical Quest’ game are out and instead Disney’s most famous mouse can be dressed in sweeper, safari or cowboy clothes. For this third game, the previous six outfits in the series are gone and once again our protagonists have new threads. They are now able to dress up as knights, wood cutters and conjurers. It’s the implementation of these outfits though that elevates the third game to “best in the series status”. In ‘TheGreat Circus Mystery’ there was no difference between Mickey and his companion Minnie, however in ‘Magical Quest 3’ Donald’s inclusion affects gameplay. Unlike Minnie, Donald looks distinct enough that he can’t be confused with Mickey but there aren’t just aesthetic differences between the two playable protagonists. Unsuited there only minor variations in jump height and speed, but when some outfits are worn Donald and Mickey behave very differently. Mickey’s knight armour is Medieval-esque, with a glistening helmet, lance and shield. Donald however isn’t worthy of such finery; evidently it’s because he has an excessively large “tail”. Instead the neurotic duck is forced to wear a barrel and carry a hammer. Naturally, as they are so different each costume has their own benefits. Donald's weapon can be used to break certain obstructions yet it can only be aimed forward. Meanwhile Mickey's lance can be aimed vertically. When submerged the weight of Mickey's armour will sink him, however Donald's allows him to float. To cater for solo play, you will be able to complete stages as either character but when playing with two, the benefits of the differing outfits can be shared. For example, Mickey can take a ride on Donald's back across the water. Admittedly the other costumes are less creative. The woodcutter costume allows both characters to climb vertical trees and descend zip lines, while also offering the ability to shift heavy objects. As a conjurer, the Showman costume lets Mickey unleash doves at opponents, changing them into various usable objects. Donald’s equivalent outfit sees him dress as a genie, producing puffs of smoke from a magic lamp; ultimately though it does the same thing as Showman Mickey’s doves. Regardless of their attire Mickey and Donald can toss each other around the levels, accessing areas that were previously out of reach. They can also grab and spin blocks and opponents when dressed normally. In each stage, there are a number of hidden doors which will give you access to a pick a card style Bonus Game or shops. In these you can spend the coins acquired in levels on costume upgrades, lives and extending your health meter. Capcom have successfully included all the visual identifiers that’s make this cast of characters so tireless and instantly familiar to even the slightest Disney fan. Everything in the game remains faithful to the characters we've all come to know and love with a layer of visual polish befitting the Disney legacy. “Graphics are lush and colourful and the sprites are almost as well animated as a classic Disney cartoon” claimed video game critic Andrew Bub. Characters move gracefully with smooth animation, and the games’ central characters are made to look even better thanks to the colourful and varied worlds they inhabit. Admittedly, Woods, pirate ships and under water stages are hardly revolutionary settings. 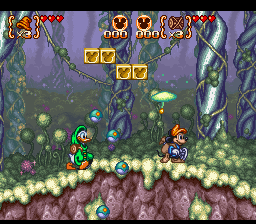 But while they may be familiar to platform game aficionados in other games they rarely look this vibrant or detailed. As is often the case with these games, graphical splendour does come at the cost of clarity. The second world for example features trees that Mickey must jump between. With the exception of being brighter, the climbable branches look identical to those in the background frequently leading to confusion. The game also is victim to slow-down, but only at very specific times. 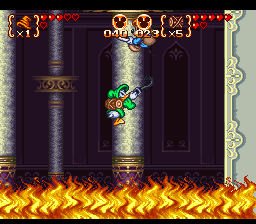 Peppering the levels are larger pull-string item boxes that once activated, create a cascade of coins or hearts. They also appeared in earlier games, but the difference then was that they didn’t cause the game to grind to a near stop. The slowdown is bizarrely regular almost to the point where it feels like a deliberate game play choice. Bosses too are prone to lower frame rates. The bigger they are, the harder the games frame rate falls. By 1995, after a dozen ‘Mega Man’ games, Capcom had become pretty adept at creating intimidating end of level big boss fights. Sadly there was a dip in creativity for the second game, so it’s nice to see that these battles are once again more imaginative in this third ‘Magical Quest’ game. Typically they’re best tackled by wearing which ever suit was commonly used in the preceding stage. 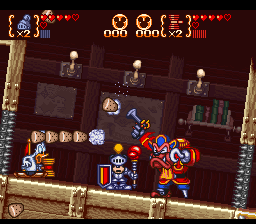 One boss for example can be quickly dispatched by turning projectiles into heavy weights using the Showman outfit. Another perpetually scrolling boss-fight is only approachable if you’re wearing the wood cutter outfit, as the challenge you must take on involves leaping from tree to tree. During a dual with a pirate captain the knight outfit should be favoured, as the level continual rotates to reflect the orientation of the ship. Here the ability to quickly attack in multiple directions is invaluable. While the boss battles do present a challenge should you die during them you won’t have to start from the beginning again like you would in a ‘Mega Man’ game for example. Instead you’ll return to life as a balloon which means Mickey or Donald can resume the battle anywhere on the screen, with bosses not recouping any energy during your downtime. Ultimately this means that even the end game boss can be defeated fairly easily provided you have enough lives banked. Needless to say with two players, the boss battles (and the game in general) become far easier. A second player can drop into the game at any point and ‘Magical Quest 3’s difficulty doesn’t scale to reflect the number of people playing. 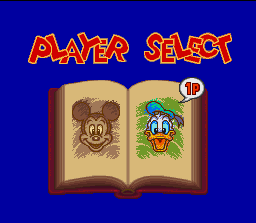 With both Mickey and Donald on screen the game is twice as easy, which is perhaps to its detriment as it was never that hard even when played alone. Unlike ‘World of Illusion’ where the stages differ depending on how many players are enjoying the game, the levels of ‘Magical Quest 3’ are identical in single and two player mode. The series’ lack of challenge has been noted by reviewers since the first ‘Magical Quest’ game, and it’s often pointed out that this makes the games accessible to children. It’s worth noting that ‘Magical Quest 3’ does have three difficulty settings available in the options screen. However harder modes only limited the amount of energy a charter has per life and with plenty of continues even the games hardest mode doesn’t present much of a challenge. Retrospectively the GameSpy website was fans of the game. “Disney's ‘Magical Quest 3’ is a great platform game for Disney fans of all ages”. It was an opinion shared by 1up, who said that “compared to other kiddie-oriented crap [this] is downright fantastic.” They feel ‘Magical Quest 3’ “is a lush, cartoon-flavored flashback to a different era”, that when compared to other Super Nintendo games, is “a great second-string title when players [have worn] out their copies of ‘Yoshi's Island’ and ‘Chrono Trigger’.” Conversely, Nintendo World Report claimed that “It’s easy to see why this game never made it over to the states in the first place [...] it's hampered by bad level design and boring gameplay”. While it doesn’t top ‘World ofIllusion’ as the greatest 16bit Mickey Mouse game, I certainly found it to be the best of the ‘Magical Quest’ series. The reason it never got released outside of Japan was more to do with timing than quality. It was released in Japan on December 8, 1995 and probably wouldn’t have reached the West until mid 1996. By this time the PlayStation has found its foothold; heralding an era of polygon graphics and 3D gameplay. A sprite based 2D platform game was considered out-dated and a new wave of edgier teenager focused games only made a family friendly Disney game less appealing or relevant. Of course the primitive 3D graphics of earlier PS1 games aged far worse than the beautiful sprites seen in ‘Magical Quest 3’. So it’s fantastic that the game was revived on the GBA where it did get to enjoy the world wide release that a game of this quality deserves. As has been the case, with other Disney games in the past, when I'm going to Disneyland excitement takes over logic. I buy a game to play on the journey, and as I know own the majority of 16bit Disney titles the ones that remain carry a premium price tag. That being said, I managed to import the Super Famicom version of this game for around £30 which is less than the going rate. It was without a manual, however I did buy an unboxed English version of the GBA game which came with instructions. It may not relate exactly to the SFC edition, but at least I can read it!